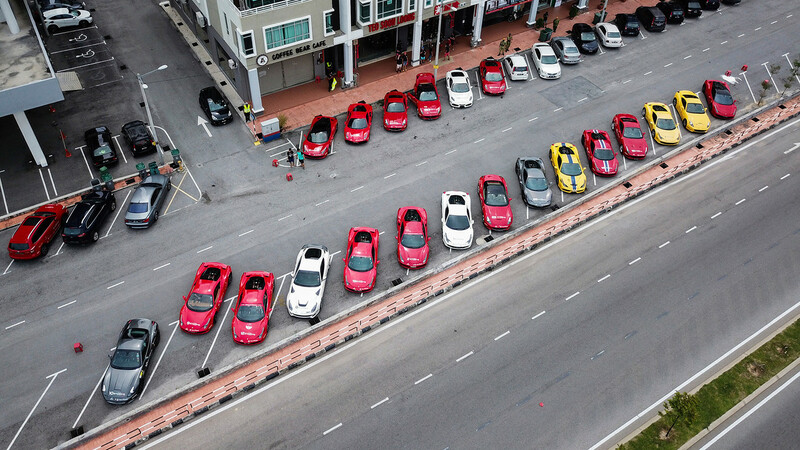 In the spirit of camaraderie formed around the passion of the Prancing Horse and the celebratory note of the brand’s 70th Anniversary, members of the Ferrari Owners Club Singapore (FOCS) came together for the 2017 Drive of the Year along the west coast of Malaysia. A gathering which brought together over 20 prancing horses and more than 50 owners and guests, the highly anticipated annual event was a time of rekindling friendships and fine-tuning driving skills amidst scrumptious bites, winding roads and scenic landscapes. Departing from Gelang Petah, Johor, the convoy which consisted of models from the latest 488 GTB to the F430, covered the long stretch of highway to Ipoh, Perak, which allowed engines and soundtrack of the Maranello cars out for a good run. After a lunch stop at Sun Swee Kiong restaurant for fresh seafood, the convoy arrived at Malaysia’s first luxury natural hot springs wellness retreat. Banjaran Hotspring Retreat is nestled in a 22.7-acre valley, cradled by 260 million-year old towering Paleozoic limestone hills, verdant rainforest, rejuvenating geothermal hot springs, natural caves and cascading waterfalls. The unique hideaway provided a rest stop in the evenings as the days were filled with thrilling B-road drives in the mountains, explorations of the neighbouring Ipoh Old Town and traditional hawker fare. “We are always happy to support FOCS in their drives. Ferrari cars are a reflection of great passion and emotion,” said Nick Syn, Director at Ital Auto, “and in the year of Ferrari’s 70th Anniversary we are especially delighted that the desire amongst Ferrari owners to come together to share their passion and experiences is as strong as ever”.